Perhaps it is the hot Summer days that are causing me to pause and remember this past Winter. It was a rough one weather-wise for a lot of us, I know. Yet I think time can heal all wounds as I find myself looking back on it fondly, remembering a special trip we took with friends to Scotland to ring in the New Year. On the drive from London up North, we stopped in the Lake District in what has to be one the most fabulous manor homes I have ever seen. Its not fabulous due to its size or even its gardens, but because of its perfect blend of old and new, hospitality without too much formality. Its luxuriousness is presented somewhat formally, yet at the same time in an utterly comfortable way. The place I am talking about is Askham Hall in Cumbria and it is just about perfect. 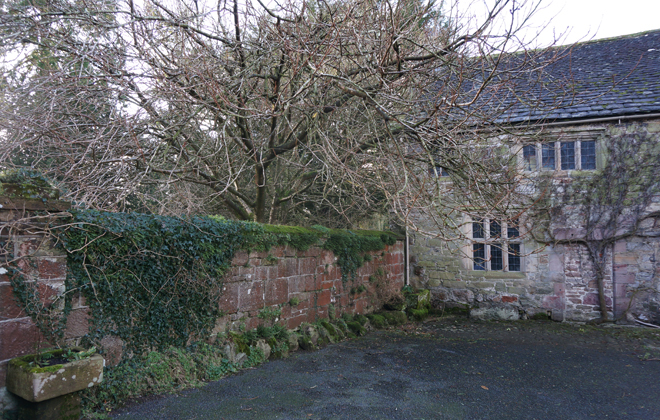 Askham Hall is a Grade 1 listed building built in the 14th century surrounded by 400 acres of open land. 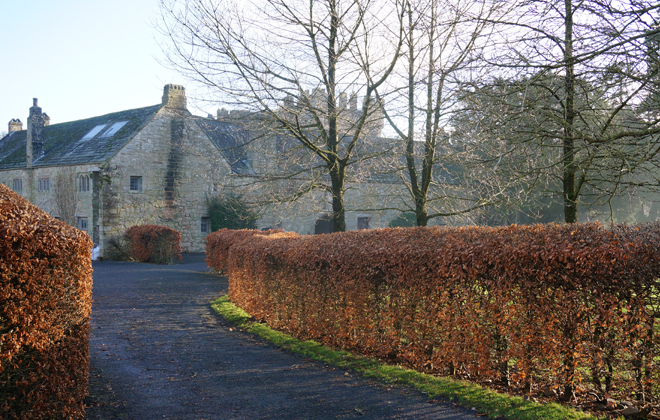 During our stay, we had the pleasure of getting to know the owner/hotelier Charlie Lowther whose family has owned this home for many, many generations as well as nearby Lowther Castle. 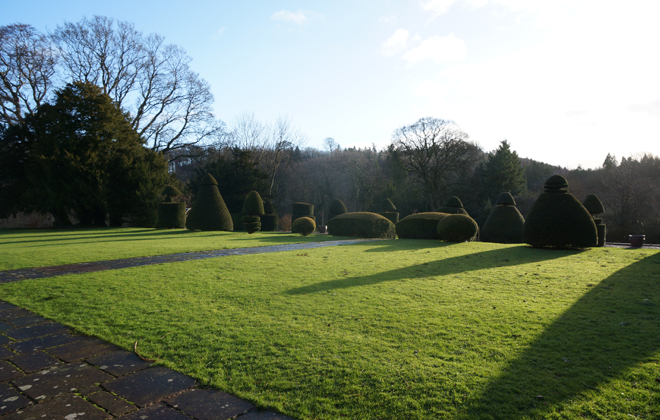 The impeccable gardens of Askham Hall. Image by Interior Monologue. 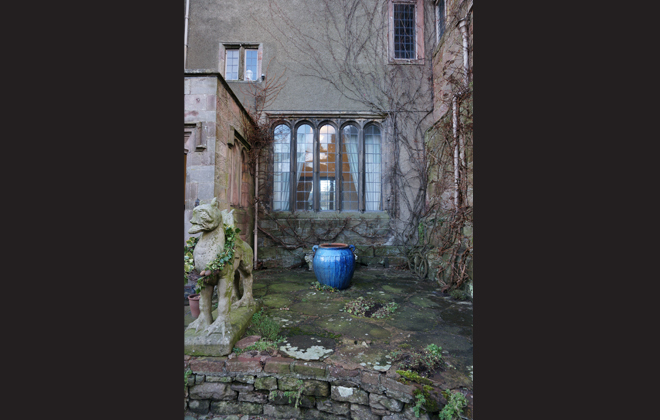 The inner courtyard was simply serene on this bleak Winter day. All images by Interior Monologue. Charlie is a hands-on farmer, a foodie, a modern thinker, publican, and now hotelier and restauranteur. His vision for Askham Hall is this perfect mix of the old and the new which made it a perfect fit for Interior Monologue. We loved talking with him about his plans and vision for the future of Askham Hall at breakfast and found his energy and vision truly inspiring. I think we just about decided to join him and his efforts permanently if he would have us! In addition to the magical grounds, the warm interiors and most comfortable bedrooms, the kitchen was the real deal sealer. Headed by Richard Swale, the dinner he turned out for us was perfection. Of course, he uses local ingredients, a real farm to table effort with much coming from Askham Hall gardens and the surrounding area. But it was again how they presented the meal experience the made it so distinct. Another formal and yet casual affair that was supremely delicious. Turns out that Richard returned to Cumbria and thus, to Askham Hall, after having worked in London, France and even having a stint at NOMA in Copenhagen! Before and after dinner, you can retreat into the family lounge and bar, where you are tended to in front of a huge, old roaring fire. A grand piano, modern artwork, and old books lined the walls. Here you can flip through years of the family’s old photo albums and feel like you are a part of this magical place’s history. Worth exploring while you are there is Lowther Castle, which has fallen into a bit of disrepair, but Charlie mentioned is next in line for a restoration if they can manage it. 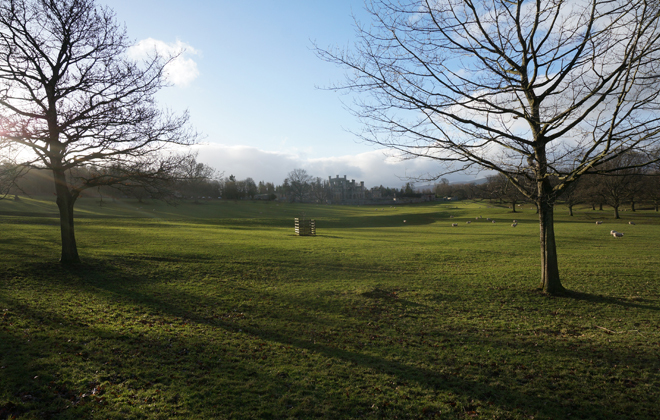 A walk through the grounds there reveals a magical setting through the morning mist dotted with sheep grazing in the meadow. It is exactly what you hope a trip to Cumbria to be. I can’t wait to go back. Way to go, Charlie! I love the climbing vines on the sides of the building. Image by Interior Monologue. 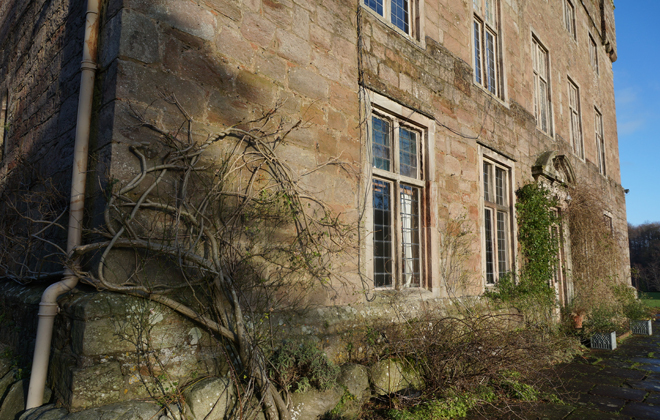 Great old stone walls and climbing vines wrap themselves around Askham Hall. 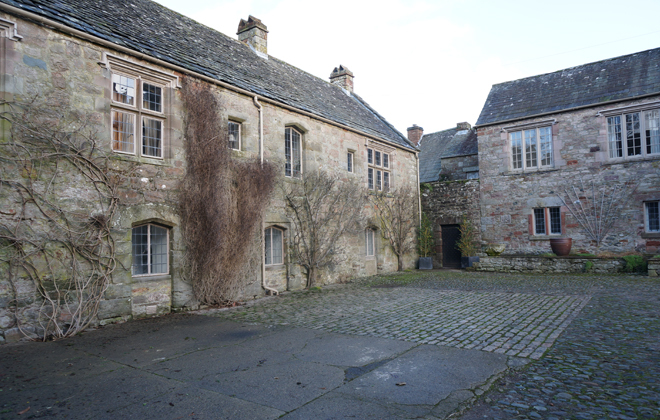 More of the courtyard and the lovely old paned windows. Lowther Castle emerges from the morning mist in the distance. All images by Interior Monologue.